Singapore, Singapore - December 1 2017 - Panasonic Singapore has started supplying its locally-harvested produce from their indoor agriculture facility to Tong Chiang Group. The premium Japanese crop varieties include green leafy lettuce; red leafy lettuce; mizuna; mini red radish; mustard wasabi; and a range of microgreens which are cultivated in Singapore's first licensed indoor vegetable farm. These crops will be selectively incorporated into the catering menus of Tong Chiang Group's portfolio of food services. Due to the shortage of arable land, 90% of Singapore's green leafy vegetables come from overseas. Hence, Panasonic aims to contribute to Singapore's self-sufficiency levels of vegetables by increasing the supply of local produce. Since the inception of the agriculture business, the company has increased its facility from 258m2 to 1154 m2 with plans for further expansion. Panasonic is also strengthening its research and development efforts to expand its crop variants to include seasonal fruits. Paul Wong, Managing Director, Panasonic Singapore, said, "One of our core growth strategies of the agriculture business is to expand our commercial partnerships with local food providers. Tong Chiang Group shares our vision in promoting Singapore's vision of increasing its self-sufficiency in agriculture and we are happy to supply our crops to them. With this, Panasonic furthers our commitment to a better life and a better world by improving the quality and freshness of local produce." Vegetables are harvested and delivered fresh from the indoor agriculture farm to Tong Chiang Group's central kitchen, ensuring quality and freshness of the crops. 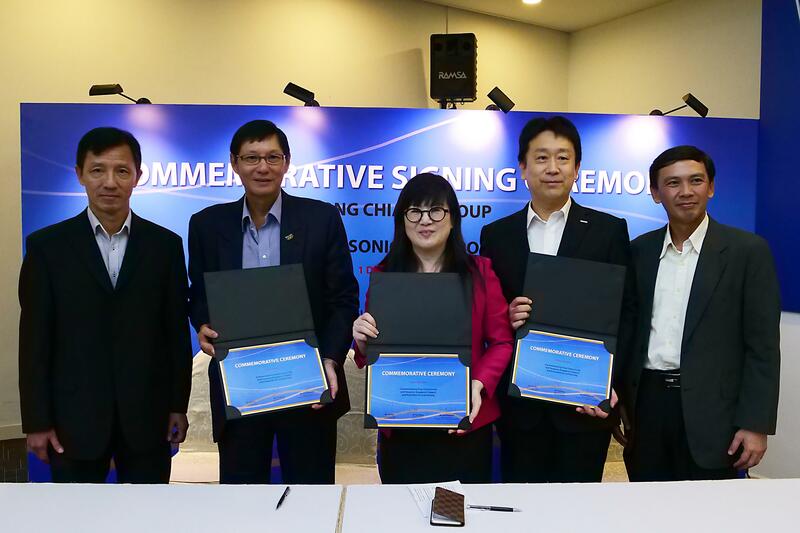 Lisa Zou, Chief Executive Officer, Tong Chiang Group commented, "Tong Chiang Group prides ourselves in offering healthy and delicious meals for Singaporean families. With rising demands for healthier food options in the local market, we look forward to working with Panasonic in delivering fresh and nutritious vegetables to our customers. The crops are locally harvested and pesticides-free, allowing our customers to enjoy healthy eating with a peace of mind." Looking ahead, Panasonic will continue promoting to increase the level of self sufficiency of leafy vegetables in Singapore. As one of the leading factory automation solutions providers, Panasonic is committed to design and develop indoor agriculture solutions to meet market demand for stable and sustainable production of locally-harvested premium crops. Panasonic's indoor vegetable farm was the first of its kind to be licensed by AVA in 2013, and its agricultural products are sold under the Veggie Life brand name. Panasonic's entry into the Agriculture Business is to contribute to Singapore's self-sufficiency in leafy vegetables. Given the shortage of land, climate changes, as well as the increasing demand for leafy vegetables, Panasonic would like to contribute towards promoting food security. Veggie Life salads feature locally-harvested, premium quality vegetables that are cultivated in the indoor farm's controlled and pesticide-free environment with optimum cultivation conditions to ensure stable, nutritious, high-quality production, complying with AVA and HACCP's stringent food safety standards. The produce is then harvested, packaged on-site and delivered on the same day to maximise freshness. Veggie Life salad is currently retailing at major local supermarkets, as well as Isetan and MEIDI-YA. Tong Chiang Group ("TC Group") began its catering business in 2007 supporting institution catering by delivering bentos ("packed meals") mainly to construction sites and factories. Subsequently, TC Group ventured into the delivery of tingkats to homes across the whole island. At the same time, TC Group expanded its reach to provide buffet setups for company functions, and private parties. The main value propositions of TC Group revolves around its capability to provide a tasty menu using less salt and sugar ("Healthier choice"), without any MSG and with good quality ingredients. In 2012, TC Group invested on advance machinery and equipment to automate work processes and increased efficiency and effectiveness. At the same time, TC Group launched various internal training programs to improve productivity.